On Monday, January 23rd, I was working one of my last days at Parallel Path. It was 4:45 and I was getting ready to wrap things up for the day when my Dad called me. This was an unusual time for him to call me so I answered the phone knowing something was different but managing my expectations. He started the conversion with the general small talk of a normal phone call, “hey, how are you?” and “what are you doing?” My answers were shorter than normal, I wanted him to get to the point and then he gave me the news I wanted. About 10 months ago my father was diagnosed with Interstitial Lung Disease, essentially an issue where the lungs suffer a traumatic event, pneumonia in my Dads case, where they don’t heal correctly afterwards. The main symptom of this is that the person has extreme difficulty breathing. There are a number of treatments depending on the severity of the case, in my fathers case he had been taking medications that were no longer working and our only option left was a lung transplant. He was reliant on an oxygen tank at all times to breathe, and the output of oxygen was consistently at the highest levels the tank could put out – yet he still had difficulties breathing. 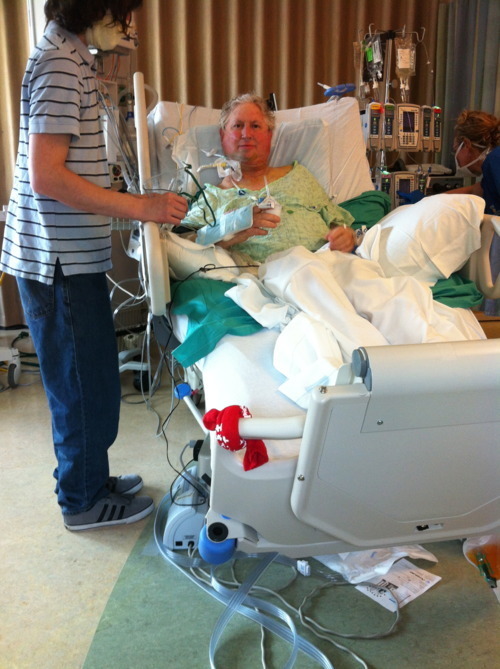 He spent months doing tests and trying to get on a lung transplant list. His first choice was to get on a list right in his backyard, at CU. He was a CU graduate, both my brother and I are CU graduates, and CU has a great program with solid numbers to back up their skills. He took the tests to make sure he was a good candidate and he was denied getting on CUs list because of some fatty tissue in his liver that could potentially cause a complication during surgery and recovery. While devastated he was not deterred, he made an extremely difficult journey to Cleveland to look at their program and complete tests for them. This journey is so difficult because he has to be on oxygen 24/7, that means carrying it with him everywhere. Tanks commonly last for 3 hours so traveling to the airport alone is 1 hour, plus the flight, plus landing and getting another tank, plus things I don’t even know about make this super difficult. 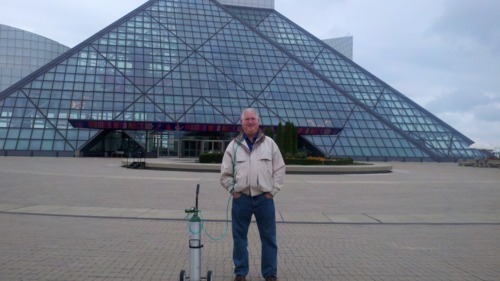 When he got to Cleveland he had to make an emergency call to have firemen come meet him as his oxygen was too low. Despite the scare he carried on. Cleveland looked at his data and was ready to accept him into their program. This would involve moving to Cleveland for about 6 months; 3 months before the actual surgery and 3 months of recovery. My Dad wasn’t ready to commit to that, and being the lovably stubborn and decisive person he is, he had another plan. Get the data and some doctors opinions from Cleveland, and use every mean necessary to get listed at CU. His amazing and supportive girlfriend, Laurie, helped throughout this whole process and through some family connections was able to get my Dads case back in front of Dr. Zamora, the head of surgery at CU. Given all the data and other doctors opinions Dr. Zamora reconsidered and allowed my Dad onto CUs list. This was a gigantic win for us! My Dads condition was pretty bad at this point, medication was no longer helping him so he stopped taking them. His condition was so bad that he was immediately put at the top of the list for his blood type, from what I understand this is pretty unusual. This was back in November, and we had heard lots of myths about Christmas, New Years, and the holidays in general being a good time for transplants. The thought is that people drink and drive and there is bad weather so there is a spike in available organs. However that is indeed a myth and my fathers physical therapist who was helping him to get in shape for surgery said that she thought before the end of January we would have an available lung. As the holidays passed and my father condition worsened it was clear that something had to happen soon. On January 18th a lung became available, however it had a very rare blood type which matched to another candidate with the same blood type. That lung went to a man who my father had met named John and he apparently had a rough surgery but is recovering and making progress. We were still waiting for a lung. This brings us back to the call with my father, his small talk was leading up to him telling me that there was a potential match and to hang tight. I was ready to jump in the car and be to Denver immediately but because it wasn’t confirmed yet they were not going to the hospital. I patiently waited and just as I sat down to dinner at 7 I got the call that the lung was confirmed and everyone was headed to the hospital. I quickly chowed my dinner and sped to Denver going 100mph easily. I figured if a cop saw me I just wouldn’t stop, I’d go straight to the hospital and he could ticket me later. Luckily I didn’t get pulled over. It turns out that my speeding was for nothing, when you are getting a lung transplant it is a lot of hurry-up-and-wait. I got to the hospital around 8pm and most of my family was already there. We waited and heard rumors about an 11pm surgery time, however this passed without us making any moves. The doctors kept us as informed as they could but much of what they know about the organs they cannot disclose. Everyone kept telling us that there is always the potential that there could be something wrong with the lung and literally up until the moment that the lung is in the body everything could fall apart and we would have to wait for another lung. We began to hear mummblings about a 2am surgery time. We stayed up talking and joking, trying to stay optimistic while dealing with the obvious anxiety everyone shared. 2am came and went. The nurse thought it was best that my Dad get some sleep as we were now expecting the surgery to happen in the morning. The family that was left went to a waiting area and tried to sleep or occupy ourselves as we waited. Around 4am Nicole, who was the nurse assigned to my father, came into the waiting area and notified us that we were set for a 6am surgery time but that she was going to let my father sleep til 5. It was tough to hold in such great news so we walked around the hospital for an hour. 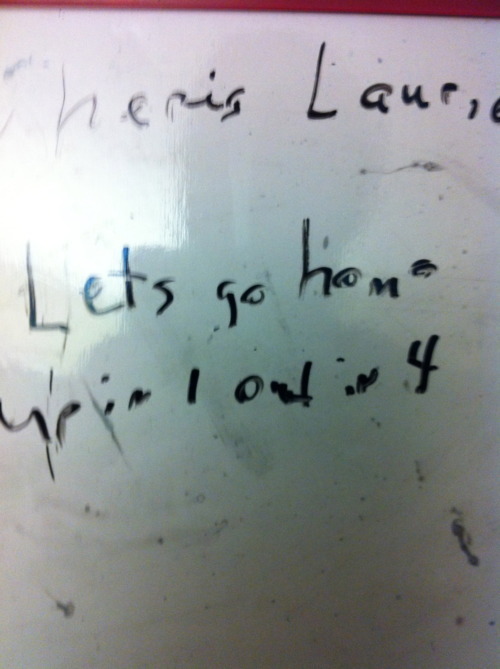 At 5:15 or so we walked into my fathers hospital room and he and his girlfriend were both awake. The lights were off but my Dad was listening to music and Laurie was on the floor attempting to sleep. Nicole was in the bathroom prepping some things. I said to my father excited to confirm with him “surgery at six!” He responded with “what?” I was confused but repeated myself again excitedly, “surgery at six!” He said, “really?” which is when I realized Nicole hadn’t said anything yet. I felt honored to have been able to break the news to him. We began to final preparations to take him downstairs were we would wait for him to go into surgery. Around 6:15 we headed downstairs and met with the anesthesiologist and waited to meet with the surgeon. The surgeon ended up being a man name Dr. Mitchell who we had heard great things about, he is chief of Thoracic Surgery at CU. He was a very concise and funny man. He walked into our curtained-off area and said “I’m Dr. Mitchell and I’m going to put your new lung in.” My Dad responded with “thank you” to which Dr. Mitchell nonchalantly responded “you’re welcome” followed by a long paused. Everyone just burst into laughter. He proceeded to tell us all about the surgery, the complications, and the team that would be helping my father throughout the process. Then it was time to say goodbye. I didn’t realize it at the time but this has got to be one of the most brave moments I’ve ever experienced. My father was about to let someone sedate him, not knowing if he was going to wake up ever again. My eyes are tearing up as I write this just thinking about what it must have been like in his head. It is undoubtedly the right thing to do to get the transplant, but rationality doesn’t take into account mortality. The math is in favor of the transplant, without it he would surely die soon, but with a new lung he has a chance to live a normal life for a while longer. The reality is that once you are under everything is out of your hands. This was my epiphany of my fathers bravery, and I only could realize it now, some 12 hours after the surgery was over. At around 11am Dr. Mitchell came to tell us that the surgery was completed without any complications and that we would be able to see my Dad in about an hour. It was exactly like in the movies when a doctor comes to tell the family good news, everyone is excited and grateful. Dr. Mitchell was astonishingly humble for having just saved a man life. We got to see my father, still sedated, with machines breathing for him. He looked strong for having just been through major surgery. Currently, my father is still sedated, as is standard procedure. Early tomorrow morning I am going to the hospital again to be there when they wake him and attempt to take him off of the machines. Hopefully tomorrow he will be up and walking around and out of the hospital within a week or so. My dad kept telling everyone “up in 1, out in 4” which means up and walking around in 1 day and out of the hospital in 4 days, he heard that the record was out in 5 days so he, of course, has to try and beat that. I am so very grateful to have such supportive family and friends, a talented surgeon (and team), a head of surgery that would reconsider his position on a candidate, and a lovably stubborn father. We are not out of the woods yet and I know everything will not go as smoothly as it has to far but I’m optimistic for his full recovery and excited that my Dad will be able to have a more normal life with a new lung. Normally I rank albums in no particular order however this year there is a clear #1 while 2-10 are in no order. Links to to the Spotify album or you can see the whole playlist here. *I purposely left off any description of the artists and the albums in hopes that you won’t write off the recommendation to listen based on what I think of an album or your assumption about a genre. Next time you have a logo or identity project, watch this video for a little inspiration. I feel like, maybe, I am doing my job wrong.